Let me be honest here. I use a credit card. It wasn’t my first choice because I try to stay out of any kind of debt, but with all of the hacking and fraud going around everywhere on the internet, my father-in-law who is an internet security expert told me about the security benefits of using a credit card. So for me, signed up for VITAL Card, which is a credit card backed by VISA that pays you forever for your referrals. It gives a 1% cash back to you for your spending, but then an additional 1% of all spending goes into a reward pool. The pool is distributed out to the users based on their “share score”. By my calculation, that’s probably around $15 per month per user being put into that reward pool. Theoretically you could earn over $15 a month per active user you refer to VITAL Card. But I will NEVER advocate for my readers to get a credit card unless they have an emergency fund buffer, a bunch of cash in their checking account, so that they can pay back the credit every month without problems. I can’t tell you how many times I have almost made decisions based on how much money is in my checking account but then had to stop myself and check the balance on the credit card. To date, it hasn’t caused problems because I’ve always had a nice buffer (and more recently a 3-6 month emergency fund) that makes it impossible for me to pay interest on credit cards. You definitely don’t want to pay the high interest on credit cards that gets so many people in trouble financially. A lot of people do not pay back their credit cards in full. That’s called revolving debt, and it is a killer for your finances. Now obviously if you invite a bunch of people to the card and get an income going, definitely get the card. However, I’d be careful for those who will sign up, get the card, and never invite people. 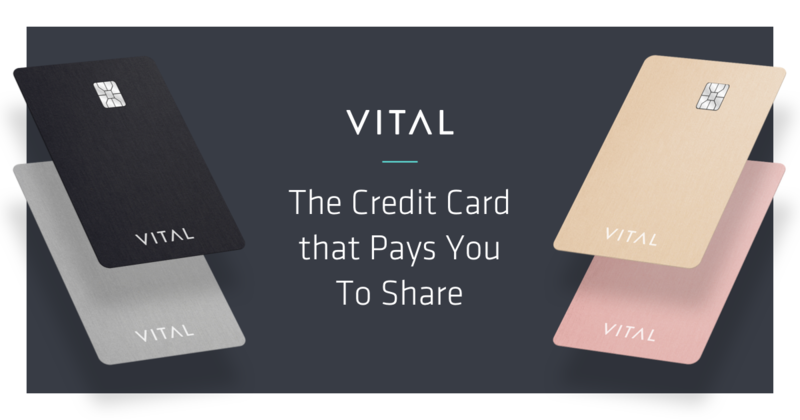 VITAL Card will be a solid $0 fee credit card with 1% cash back and completely unique social features, but the same financial pitfalls apply for that card as any other credit card.